NEW YORK -- Front-runners Donald Trump and Hillary Clinton swept to resounding victories in Tuesday's New York primary, with Trump bouncing back from a difficult stretch in his Republican campaign and Clinton pushing tantalizingly close to locking up the Democratic nomination. "The race for the nomination is in the home stretch, and victory is in sight," Clinton declared to cheering supporters. Trump captured more than 50 percent of the vote in New York and was headed toward a big delegate haul in his home state, a commanding showing that keeps him on a path to the GOP nomination if he continues to win. He claimed at least half of the 95 delegates at stake Tuesday, and was likely to add to his tally in individual congressional districts. A confident Trump insisted it was impossible for his rivals to catch him. "We don't have much of a race anymore," he said during a victory rally in the lobby of the Manhattan tower bearing his name. He peppered his brash remarks with more references to the economy and other policy proposals than normal, reflecting the influence of a new team of advisers seeking to professionalize his campaign. Clinton's triumph padded her delegate lead over rival Bernie Sanders and strengthened her claim to the Democratic nomination that eluded her eight years ago. In a shift toward the general election, she made a direct appeal to Sanders' loyal supporters, telling them she believes "there is more that unites us than divides us." Exit polls suggested Democrats were ready to rally around whoever the party nominates. Nearly 7 in 10 Sanders supporters in New York said that they would definitely or probably vote for Clinton if she is the party's pick. Sanders energized young people and liberals in New York, as he has across the country, but it wasn't enough to pull off the upset victory he desperately needed to change the trajectory of the Democratic race. Still, the Vermont senator vowed to keep competing. "We've got a shot to victory," Sanders said in an interview with The Associated Press. "We have come a very long way in the last 11 months, and we are going to fight this out until the end of the process." The fight for New York's delegate haul consumed the presidential contenders for two weeks, an eternity in the fast-moving White House race. Candidates blanketed every corner of New York, bidding for votes from Manhattan and the surrounding boroughs to the working class cities and rural enclaves that dot the rest of the state. The nominating contests will stay centered in the Northeast in the coming days, with Connecticut, Delaware, Maryland and Pennsylvania all holding contests next week. Sanders spent Tuesday in Pennsylvania, as did Republican Sen. Ted Cruz, Trump's closest rival. 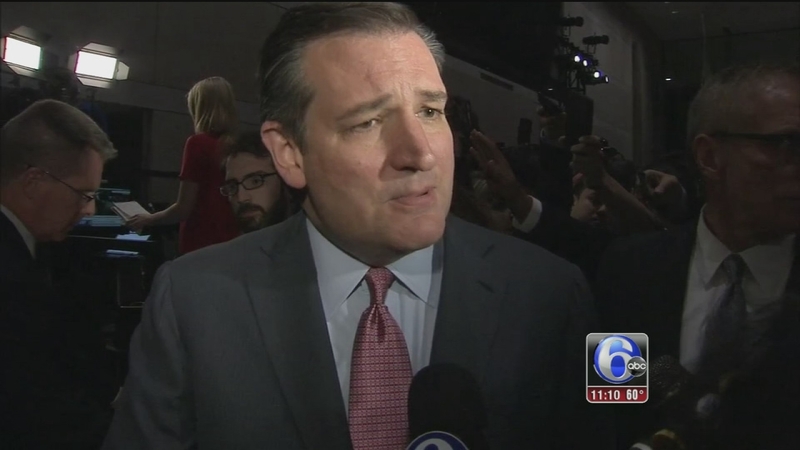 Christie Illeto caught up with presidential candidate Senator Ted Cruz at the National Constitution Center Tuesday night. Cruz panned Trump's win in New York as little more than "a politician winning his home state," then implored Republicans to unite around his candidacy. "We must unite the Republican Party because doing so is the first step in uniting all Americans," Cruz said in formal remarks. Trump needed a strong showing in New York to keep alive his chances of clinching the GOP nomination before the party's July convention - and to quiet critics who say the long primary season has exposed big deficiencies in his campaign effort. Having spent months relying on a slim staff, Trump has started hiring more seasoned campaign veterans. He's acknowledged that bringing new people into his orbit may cause some strife, but says the moves were necessary at this stage of the race. Cruz is trying to stay close enough in the delegate count to push the GOP race to a contested convention. His campaign feels confident that it's mastered the complicated process of lining up individual delegates who could shift their support to the Texas senator after a first round of convention balloting. Ohio Gov. John Kasich, the only other Republican left in the race, sought to add to his scant delegate total in New York and keep up his bid to play a long-shot spoiler at the convention. He bested Cruz on Tuesday and is refusing to end his campaign despite winning only his home state. Trump's political strength, though he boasts of drawing new members to the party, has left some Republicans concerned that his nomination could splinter the GOP. Among Republican voters in New York, nearly 6 in 10 said the nominating contest is dividing the party, according to exit polls. The surveys were conducted by Edison Research for The Associated Press and television networks. Trump now leads the GOP race with 804 delegates, ahead of Cruz with 559 and Kasich with 144. Securing the GOP nomination requires 1,237. Among Democrats, Clinton now has 1,862 delegates to Sanders' 1,161. Those totals include both pledged delegates from primaries and caucuses and superdelegates, the party insiders who can back the candidate of their choice regardless of how their state votes. It takes 2,383 to win the Democratic nomination. AP writers Lisa Lerer, Julie Bykowicz, Emily Swanson and Steve Peoples contributed to this report.